Ever get stuck trying to give the right consequences to your young child or toddler? Remember, teaching accountability by giving consequences can start early, when your child is still small. In fact, it’s one of the most important things you could ever teach them. The key is to do it in a manner appropriate for a young child. Also, keep in mind that consequences are not punishments. Punishments are designed to modify behavior by making the child suffer for their actions. Consequences, on the other hand, are designed to modify behavior by making the child learn from their actions. The difference can be subtle, at times, but just keep in mind that the key to a consequence is that the child is learning in a healthy way to be accountable for their actions. Know that whether they’re 18 months or five years old, you should always try to do the following three things when giving consequences to young kids and toddlers. Here is one simple rule of thumb. When instructing your child, use a matter-of-fact tone. It’s hard for children to pay attention to exactly what you’re saying when they sense that you’re upset or angry. Besides, you want to model the behavior you want them to learn. Give instructions in such a way that it tells the child that you expect them to master self-control at some point. Experiencing a consequence in the moment is important for this age, but take time to calm down first if you’re feeling frustrated. 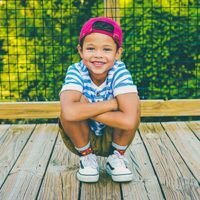 Really energetic kids may have a hard time stopping themselves, could be more impulsive and will need a lot of “hands-on” coaching from parents. Emotionally sensitive kids may feel too responsible or overwhelmed. Make sure you’re focusing on behavior and skills and not “why” they did something inappropriate. Environmentally sensitive kids need to have the over-stimulation reduced. In fact, when they’re over-stimulated, they might not even hear you when you’re talking to them. They might do best after taking a calming time-out. Those with short attention spans might have trouble carrying out a request with a lot of steps. Break the request down to one instruction at a time for them. It’s very important to understand your child’s temperament along with their skill level. 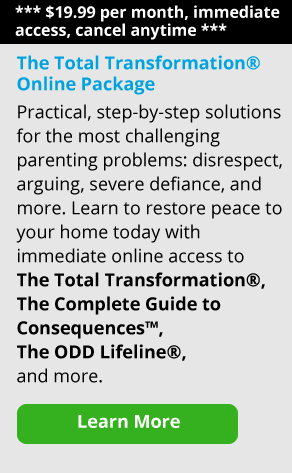 James Lehman, creator of The Total Transformation® parenting program teaches, “Start where your child is at and coach them forward.” This means you should try to understand their capacities and challenge them to do just a little bit better. For example, one of the best ways to help them learn skills is to do tasks with them. Also, it’s important to realize that it’s not necessary at this age to require a child to do their “chore” on their own. Most of the time, when your young child is acting out or behaving inappropriately, just redirecting them will be enough. If the child clearly understands that the behavior is not acceptable and yet does it anyway, try to keep the consequence directly related to the behavior. Consequences that are too harsh or that take away an unrelated possession or privilege will not help your child understand the connection between what he has done and the consequence. Giving consequences to a young child and holding them accountable takes a lot of energy and patience because your child will need a lot of rehearsal and repetition at this young age to learn to cope with his feelings and master skills. But take heart—you will eventually be rewarded with better behavior! Punishments vs. Consequences: Which Are You Using? Carole Banks, MSW holds a Masters Degree in Clinical Social Work from the University of New England. Carole has worked as a family and individual therapist for over 16 years, and is a former online parent coach for Empowering Parents. She is also the mother of three grown children and grandmother of six.